Strongly considering snagging one of those Apex parts kits for the CETMEs they have. Looks like it needs a barrel and a receiver. I can probably get my hands on a PTR 91 receiver, or I can always get a flat, and take it from there. 2 of the guys interested in seeing how the build comes out are a) an armorer and b) a nuclear, aluminum, and stainless welder. So I think I could figure the flat out, seems easy enough with the mandrels, dies, etc. Going that route, however, means finding a die, mandrel etc. What do you guys think? Anyone completed one of these builds? If you haven't already started donating to the Firearms Policy Foundation and Gun Owners of America, you should start!! 1 is in excellent, almost new condition. With a beautiful bolt head and locking piece. The other looks well used, but not abused. I bought them as a cheap source of spare parts for the 2 Cetmes I alreadyhave. if you get the bending jig it will come out very nicely. I have done 3 receivers with a homemade rig and it would have been worth it to buy the jig. I was curious about them as well. But also as a spares source for my pops and is CETMEs more than anything. Tho I've really thought building one would be awesome. I've been looking into purchasing a complete receiver. I found some from PTR. The last kit I bought from Apex had a ground bolt head, should've been 1.832" long, measured 1.821" long. Every ground bolt head I've ever seen or read about has been 1.821" long. For a long time CAI took all the flak for grinding bolt heads but after finding this in a Spanish kit I suspect that it may have been an armory trick all along. Hmmm. I'm trying to learn as much as fast as I can before I jump into this project. Would a ground bolt head, but with a bolt face that did not fail headspacing, require replacing the bolt? The extra .011" has to be factored in to the gap measurement if a ground bolt head is used. Instead of the .004"~.020" spec used with full length bolt heads a ground head would change the spec to .015"~.031" in order to position the bolt locking lever properly on the ramp of the bolt. Bought my first CETME a few years ago after asking questions here and doing a good Q.C. on the rifle. Passed all specs so pitched in truck and rode around till one day found myself working on a large logging/grading site and no workers. Loggers were done, graders almost done but too wet to make mud holes so all equipment was parked in corner of lot and supervisor was watching service guy grease all the machines. Asked if o.k. to shoot and said long as none of his machines got hurt could care less. Had over 200 acres logged and 2/3 at some form of grading so had 20 foot steps of red clay as back stops in places, stumps and all kinds of exposed rocks and dirt clods to bust. Had about 400 rounds of ZQI in truck and after running all but last two boxes so had a pair of loaded magazines to get me home and had been busting dirt clods and rocks out to 250 yards like free and stumps to 400 yards could skin the bark off them without effort. Slung brass like a champ and ran as smooth as my H&K 91/G3's near as could tell. Was stunned as don't run iron sights except with Boy Scouts shooting rimfire or a few of my target rifles and M1a's. All the trash talk about the drunken monkey built rifles and I was suprised. Have not let a CETME get by without doing a good Q.C. on it. Now have five and three shoot excellent with other two meeting all minimum acceptable standards of accuracy. All run 100% reliable and have been purchased at fair prices. Rule now is look at all I see, do a quality control check on specs with good visual inspection and if can negotiate a good price bring them home. Have only shot an HK once since adopted the fleet of CETME's. May need to get a couple of the parts kits for spare parts. May get a wild hair and build one but have so many AR, 1911, 10/22 and FAL projects piled up chasing deals on drunken monkey builds may be best choice but a few parts kits, pick out best and see if using the one CETME I call the least accurate of the group as a donor build a kit on it and see if have a better rifle. Anyone have an aftermarket barrel recommendation? What do ya'll think of these guys? Last edited by SawbriarRips; April 13, 2018 at 11:50. RCM makes a lot of the new parts for HKParts. Good stuff. Where do you plan on getting a barrel? I have a complete CETME parts kit to include barrel and either 4 or 6 mags (can't remember). I bought it from Harlan at FAC a long time ago - I believe it is a Portuguese CETME. Have to dig it out and look. Portuguese would be an HK G3 contract rifle. I couldn't remember off the top of my head. I'll dig it out and get some pictures of it. I want to sell it but I'm not even sure what to ask for it. I have a kit with barrel and a correct RTG flat I've been itching to build. Even bought a wire welder. Need to build a jig for bending but have back burnered the project. Kind of cold feet. Do your research before pricing, I'm sure it was a good investment for you. The Spanish ones are going pretty cheap. Thats why I'm interested. $150 for a parts kit, $150-200 for a new barrel. $175 for a receiver (not a flat). I'm assuming I'll spend $50-250 in miscellaneous parts / stuff I screw up. Whatevers left of that is going into mags. Found a site with $5 mags if you buy 10 or more. I appreciate the info guys. I've been creeping weaponsguild hard and really understanding what I'm getting myself into. Luckily I have a buddy who's an armorer and another who's a gunsmith who are intrigued by my idea. If one is to go to the expense of a new build, use a new barrel. The RCM barrel specs look way attractive. Thanks Holescreek, you and others at http://www.militaryfirearm.com/ are good to go. Last edited by SawbriarRips; April 14, 2018 at 11:45. I remember cetmerifles.com but this sight seems to be a shadow of the old one. There's isn't much material and no index, do you have links to your articles? OK, so not all that many showed up. Probably need different search terms but they are all there, plus some new ones that never were on WG. There's one on how to make your own locking pieces for those with some tools. Ok, I'm blonde. Forgot that I signed up way back when. Once I signed in I can see much more. Holescreek's link still doesn't work but I can see everything once again. Thank you! I've been slammed with work so I haven't had too much free time. But I'll be digging through these asap! I've not been much of a fan of HK type rifles... but hey that's me. Anyhow my son had to have a cetme he saw at knob creek . Was $800 and came with 21 mags - all parker finish cetme mags. Also came with a cetme mag loader. Klunky looking parker finished metal thing but it holds mags tight and is actually a pleasure to load mags with it. It's a century build. I'm thinking my boy didn't get a deal ...but you know "kids"...they just gotta have that new thing. We shot 100 + rds of Malaysian surplus through it. Typical spongey goober trigger , and flings brass like a typical HK variant... though does not ding it up like the HK and PTR91 rifles I had years ago. 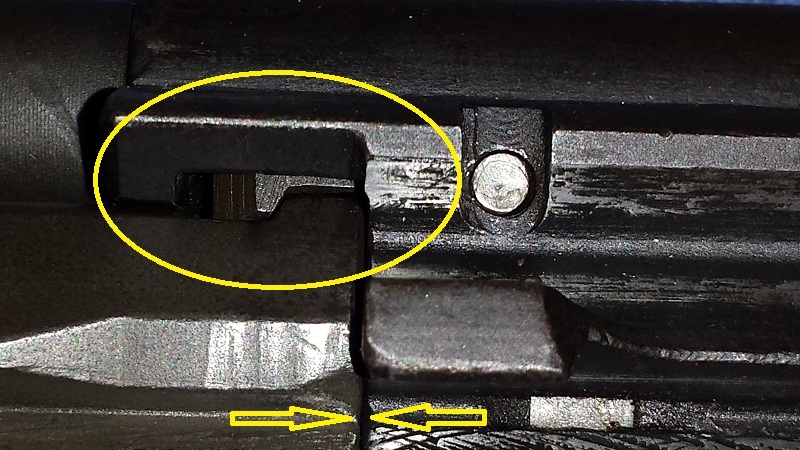 Seemed not to have horizontal sight issues and was on target with issue sights .... just that lousy HK trigger pull. My son has been putting BLO on stock and handguard....yeah he likes it. Anyone know where surplus cetme slings can be had ?. You can replace that Cetme pack with a tuned HK trigger pack and safety lever and get a very nice trigger, it's well worth the exchange. The first hit in Google for Cetme slings was CAI itself for <$6. I did a search and CAI didn't turn up. Anyhow I went to their sight and viola...they have them as you say. Only thing I noted was the only way they advertise parts is in "Kits". I don't want a kit loaded with 99% of the parts useless to me. I emailed them to see if they have the couple bits I need individually. They might be able to help, I've never bought anything direct from them. A couple years ago they sold a lot of their spare parts to Apex Gun Parts. APEX bought ALL the remaining parts that Century brought in from Spain after they purchased all the inventory that was at Santa Barbara (CETME factory) from General Dynamics. That was more than a few years ago! Century had decided to they were done with manufacturing the CETME C and had no need to keep a stock of the parts. Counting every little pin, spring, washer, fitting, grip, trigger box, wood stock, sling, cleaning kit, sub assembly, bolt, ejectors, firing pins, mag catches, charging handle, rear sight detent balls, bolt carrier,,,etc...etc... we received over 1,000,000 parts. We have one 40ft shipping container of CETME stuff we have not opened up in years because we haven't needed the contents. Then a couple of years ago Century bought all the remaining CETME's in the Spanish forces and started building the C-308. APEX has been receiving steady shipments for the Model C kits, magazines, bayonets, etc. Soon MarColMar will make the Model L rifles a reality for the American shooting public! I am looking forward to that!